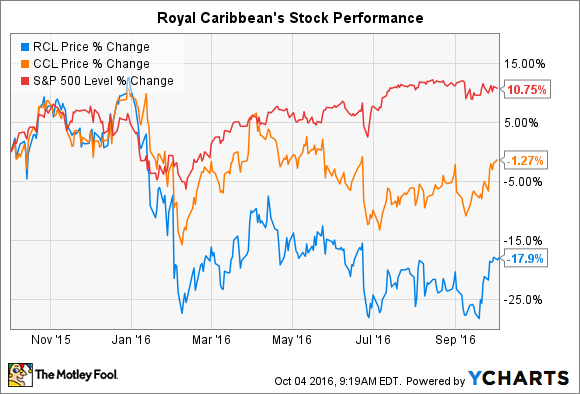 Can Royal Caribbean Stock Keep Cruising After Its Recent 14% Spike? The case for more gains ahead for the cruise ship operator. Royal Caribbean (NYSE:RCL) shareholders enjoyed a strong finish to September as their stock rose 14% over the final 10 days of the month. The gain didn't do much to close the gap with rival Carnival (NYSE:CCL), though. Even after the bounce, Royal Caribbean is down almost 20% in the last 12 months compared to a 1% loss for Carnival and an 11% gain for the broader market. Below I'll highlight a few drivers behind Royal Caribbean's late-September surge and look at whether these trends point to better days ahead for its shareholders. The biggest catalyst behind the stock's move was Royal Caribbean's announcement on Sept. 19 that it will raise its dividend 28% to $0.48 per share. This boost follows a 20% raise in 2014 and a 25% jump last year. Royal Caribbean is now yielding 2.6%, not far below Carnival's 2.9%. Executives didn't cite operating trends as support for the latest dividend hike, saying only that the raise was part of the company's "continuing efforts to increase shareholder returns." But recent financial results had to give Royal Caribbean confidence that it could afford a significant increase. Net income is up 43% over the last six months and operating cash flow is up by 22%, so the dividend could easily jump higher without raising Royal Caribbean's payout ratio or draining its cash balances. Royal Caribbean's business is enjoying steady but uneven growth right now. Sluggish economic conditions in parts of Europe and Asia have pulled results lower. However, gains in the critical U.S. market have more than offset those losses. In fact, overall net yield per passenger cruise day should rise by as much as 4.5% this year, which would be an improvement over last year's 3.5% growth. By comparison, Carnival projects yields improving by 3.5% in 2016. At the same time, Royal Caribbean executives expect lower fuel expenses to help overall costs drop about 1.5% Put these favorable trends together, and you can see why management is confident about the outlook for profits. "Our business remains strong and we continue to improve our return profile," CEO Richard Fain told investors in early August. Fain and his executive team affirmed their long-term goal to double 2014's adjusted earnings by the end of 2017 (aiming for at least $6.78 per share) while boosting return on invested capital to at least 10% (from 6%). The company has made big strides this year toward hitting those targets despite the negative impact of currency moves. Profit is expected to be $6.10 per share in 2016, up 25% from last year's result. If it just meets its target for the second half of this year, the company would then just need a further 12% earnings boost in 2017 to reach its aggressive profit growth goal. This appears achievable, considering that Royal Caribbean and Carnival are both enjoying record levels of vacation bookings. There's no telling whether economic growth will pick up in its key markets, or whether currency swings will sink Royal Caribbean's profit plans. However, its key operating metrics are pointing higher, and it is producing plenty of excess cash that it can send to shareholders through moves like this quarter's large dividend boost. Meanwhile, investors can purchase the stock at a slight discount to Carnival on both a revenue and profit basis, which suggests this stock's performance could easily continue closing the gap between rivals and the market over the next year.